Insidious: The Last Key is a 2018 American supernatural horror film directed by Adam Robitel and written by Leigh Whannell. 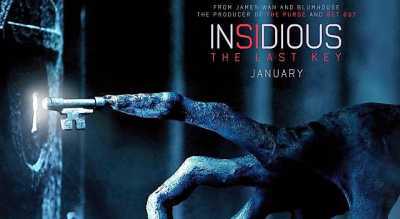 It is the fourth installment in the Insidious franchise, and the second in terms of the series’s in-story chronology, following 2015’s Insidious: Chapter 3. It stars Lin Shaye, Angus Sampson, Whannell, Josh Stewart, and Caitlin Gerard. The film follows parapsychologist Elise Rainier as she investigates a haunting in her childhood home. The film was released in the United States on January 5, 2018, by Universal Pictures, and received mixed reviews from critics, praising Shaye’s performance with some claiming the franchise had run its course. After the events in the previous film, Elise Rainier goes on to investigate the recent supernatural disturbances occurring in a family’s home in New Mexico, a house in which she used to live in her youth, diving her deeper into The Further.